In ancient times, the mud flats and raised coral surrounding the village of Kou supported a forest of loulu palms, a`ali`i and kanaloa trees. Hawaiians settled in the area from an early date. The presence of Nu`uanu Stream - a permanent fresh water stream running to Mamala Bay - provided an estuary area with rich soils and Hawaiians built a fishpond archaeologists have dated to 890 AD, perhaps one of the oldest fishponds in the Islands. Pukaka heiau was nearby - where Aloha Tower stands today - a temple of healing dedicated to the god Lono. The area surrounding Mamala Bay drew Polynesian settlers from an early time, but Oahu's ali`i generally preferred to base themselves near Waikiki rather than the flats at Kou. The fishermen of Kou worked the waters of the bay, but the area offered limited canoe landings. In contrast, Waikiki enjoyed many channels through the reef for easy beaching of canoes, better surf and closer access to deep sea fishing. While the name Kou referred to the village and harbor, Honolulu was the larger ahupua`a. This land section included the areas between Waikiki and Kapalama, including Punchbowl and Kewalo. The name Kou may have been inspired by groves of kou trees in the area. For a spell, the harbor area was known among foreigners as "Fair Haven." Captain William Brown, visiting O`ahu in the late 1700s with his ships the Jackal and Prince Lee Boo, named the harbor and also helped the local chief win control of the island by supplying him with Western weapons. The exchange ended sadly with the murder of Brown (followed later by the revenge murders of several Hawaiians), the first killing of a Westerner on O`ahu. The name Fair Haven fell out of use by the 1820s. Honolulu became the official name of the growing town in 1825 or so, years after the arrival of foreigners began to swell the population. The name Honolulu means "sheltered bay" but is also linked to legends of a stone called Honolulu, a stone that stood near where Liliha and Vineyard streets meet today, once the site of a chief's home. Honolulu may also have referred to the chief himself. Honolulu's harbor is what changed the history of Kou. Foreign sailing vessels arriving in the Hawai`i following the voyages of Captain Cook required deep harbors to anchor safely. Mamala Bay - later called Honolulu Harbor - was the best anchorage in the Islands, sheltered from both wind and ocean waves. 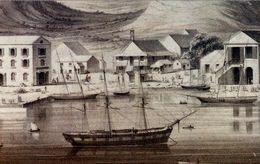 Since the first days of foreign arrivals in the late 1700s, the area adjacent to the harbor has been the focus of trade, business and social life. Here is where Honolulu began its life and where, a few years later, Chinatown was born.